The past several issues have featured the GL Honor Guard – John Stewart, Hal Jordan, Kyle Rayner and Guy Gardner – recruiting an odd assortment of soldiers in their war against the Darkstars. FINALLY, we see them go into action. 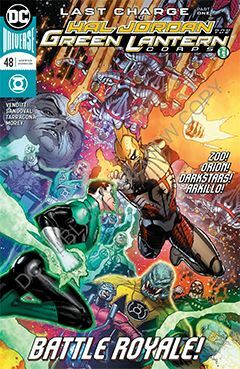 Killowog leads the bulk of the GL Corps against the bulk of the Darkstars, led by former Green Lantern Tomar Tu, while the four and their recruits infiltrate the Darkstar base. It’s all-out action as the scenes bounce back and forth from one battle to another, with seemingly equal amounts of gaining ground on one end while losing it on the other, then back again. It’s satisfying to see the action cranked up a notch, and to see the beginning of John Stewart’s plan come to fruition. However, very little happens. Lots of beat-downs on both sides, lots of witty dialogue as the various foes posture and trash talk one another. But let’s be honest: does one expect insightful and thought provoking writing when the scenario is one big battle? One should not, and I am perfectly fine with that. The chapter is entitled, “Last Charge, Part One.” But in the overall Darkstar storyline, it’s chapter seven. And I’m picking nits here, I admit, but I have a problem with this thinking. No doubt the previous six chapters will form one trade paperback, and this will be the first chapter in a follow-up. But what good is re-publishing in TPB form if the ENTIRE story is still broken into multiple volumes? I see nothing wrong with publishing an 8-chapter TPB, or a 10-chapter. I wish comic book publishers would stop crafting stories geared toward the six-chapter TPB format. I would expect it to be creatively restricting, and hinders the writer from telling a good story. For me as an end-user, I care less about the “ideal packing to meet marketing needs” and more about being entertained by a compelling narrative.